I am in the peace circle of the do. Good Stitches charity bee and March is my first month to choose the quilt design. How exciting! I recently purchased 500 Quilt Blocks (love!) and for some reason this simple block is my current favorite. Here is a little tutorial for my bee mates and anyone else who’d like to try out this block. It is extremely important to note that the numbers in the graphic represent the finished dimensions of the components. For cutting purposes, simply add a half inch to each. 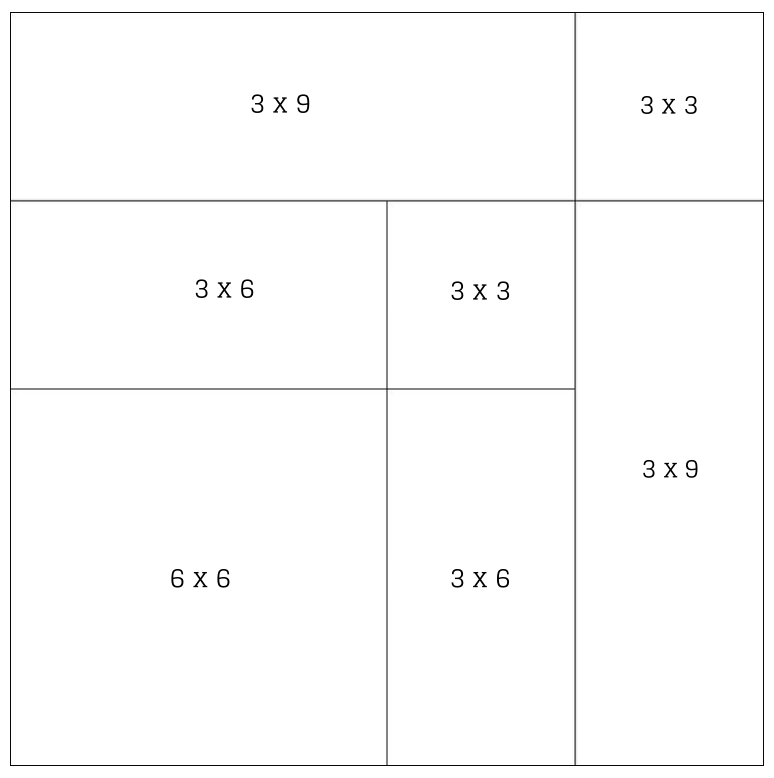 For example, you would cut a 6.5 x 6.5 inch square for the large square in the bottom left corner. 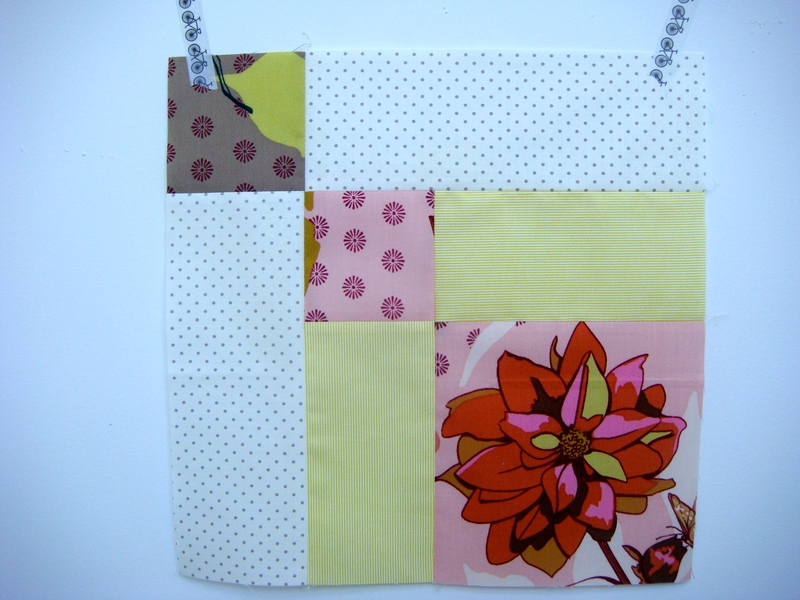 Join the 6.5 inch square to one of the 3.5 x 6.5 inch rectangles. Join a 3.5 inch square to the other 3.5 x 6.5 inch rectangle. Join the two pieces from steps 1 and 2. 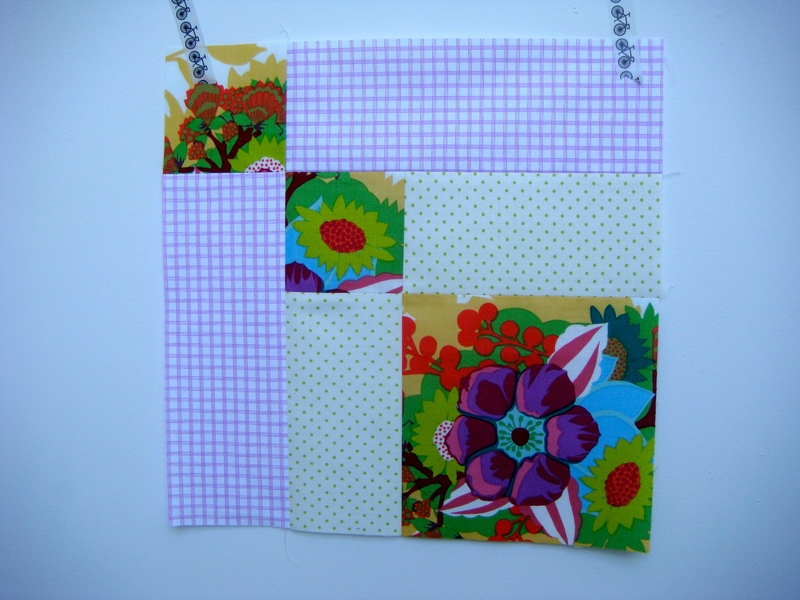 Join one of the 3.5 x 9.5 inch rectangles to the piece from step 3. 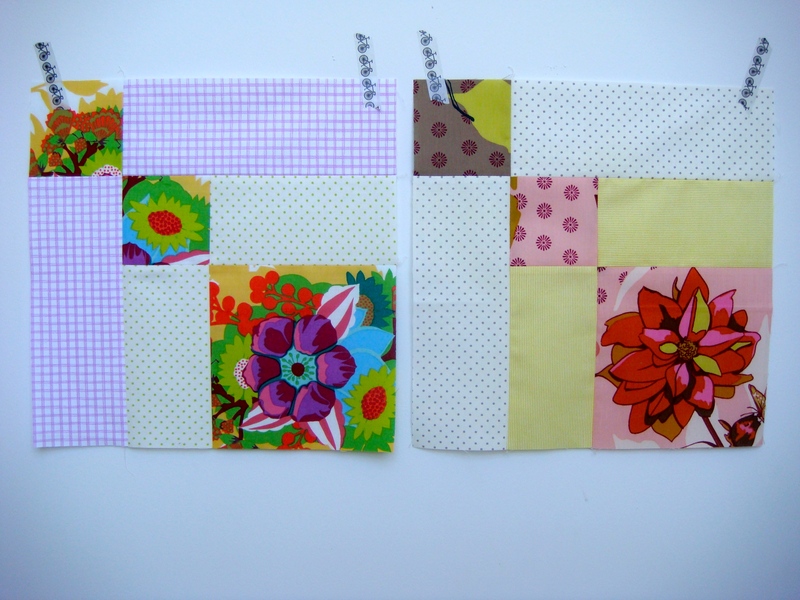 Join the last 3.5 inch square to the last 3.5 x 9.5 inch rectangle. Join the pieces from steps 4 and 5. The block will measure 12.5 inches when assembled and finish 12 inches in the quilt top. Here are the 2 blocks I completed. For the peace circle: if you can, I’d love the squares to be flowers (large scale if you have it, but medium or small is ok too) and the rectangles to be low volume (or light colored) dots or stripes. Other large-scale prints are good too (birds, trees, etc). Try to stick to the colors show here – purple, pink, green, yellow, orange, blue/turquoise. Just do your best, use what you have, and have fun! Oh, and please make 2 if you can. This entry was posted in Tutorials, Uncategorized and tagged block tutorial, do good stitches, scots plaid block, Tutorials. Bookmark the permalink. That is gorgeous!!! Love the pattern and mixture of pattern and color. Thanks for shAring!!! So pretty! Good job fussy cutting those bigger pieces. Just beautiful! Lovely block, I’m looking forward to seeing how it makes up. this quilt is going to be epic.